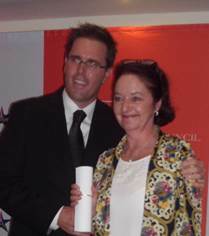 Caroline Ungersbock, co-founder of the Sustainable Tourism Partnership Programme (STPP), was the recipient of the Chairman’s Awa rd at the inaugural Tourism Grading Council of South Africa (TGCSA) Annual Assessor Conference Recognition Awards on 3 March. “This award recognizes an individual who has made extensive and significant contribution to the TGCSA’s brand through promoting the TGCSA in the areas of service to establishments, stakeholder engagement and general profiling of TGCSA initiatives”, says Thekiso Rakolojane, Marketing and Communications Manager of the TGCSA. Caroline, who was appointed to the TGCSA Awards Committee in May 2012, is a serial entrepreneur and owner of a number of businesses including a guest house, a telecommunications company and a construction company. She is passionate about tourism and has been driving home the message that ”Smaller Accommodation Establishments and Smaller Tourism Businesses have a crucial role to play in the achievement of a more sustainable industry”. She has been recognized for her passion and commitment to supporting the smaller sector and sits on a number of formal and ad-hoc committees where her voice and input have had a positive impact. “I am really honoured to have received this award, which supports me in my commitment to effecting change and promoting Tourism Growth and Development and to ensure fair treatment of Smaller Business as an equal to big business in the industry”, says Caroline. Caroline has travelled far and wide in South Africa over the past 3 years, and regularly runs workshop through the STPP, helping smaller businesses to understand their role, the importance of “participation” through associations, getting graded, adopting Sustainable Tourism Principles and collaborating at a local level. In addition, she encourages all small business owners to voice their challenges to her and Caroline takes this information back to the industry to effect change. As an example, Caroline is a regular visitor to parliament, where she presents findings of research done by the STPP to the relevant parliamentary portfolio committees and she shares as much information possible with the industry about the industry and its challenges. “Getting graded is a very important step towards sustainable business for smaller accommodation establishments. It means that they are already more competitive and compliant”, continues Caroline. The STPP would like to thank Caroline for her commitment and congratulate her on this wonderful achievement. Good work Caroline, I am interested in the Bokashi compost maker, How do i get one.